Colin Kaepernick was solid and on-target in Sunday's win. The San Francisco 49ers didn’t miss a beat by having Colin Kaepernick start against the New Orleans Saints on Sunday. 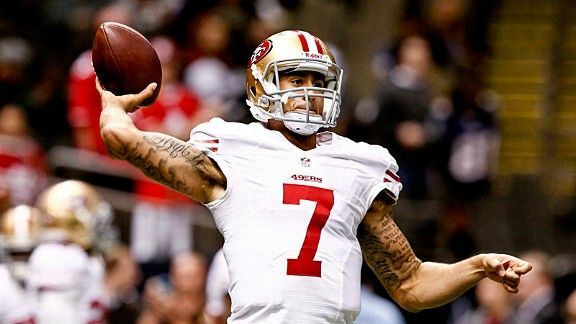 Kaepernick completed 64 percent of his throws in Sunday’s win. Coincidentally, that was a match for Smith’s completion percentage over the last two seasons. Also of note from Kaepernick’s performance. 1-Outside-the-pocket success: Kaepernick was 5-for-7 for 54 yards and a touchdown on throws made outside the pocket. For the season, Kaepernick is 11-for-18 with three touchdowns and no interceptions on his outside-the-pocket throws. Smith is 9-for-19 on such throws with one touchdown and one interception. Kaepernick has converted first downs nine times on his 18 outside-the-pocket throws. Smith has converted only four of 19. 2-Comfortable with play action: Kaepernick was 7-for-10 for 125 yards and a touchdown on his play-action pass attempts, converting first downs on all seven of those completions. He was 9-for-15 for 107 yards on his other throws, converting three first downs. The play-action was aided by the 49ers averaging nearly five yards per rush. 3-Outplayed Drew Brees: Though Brees threw for three touchdowns, he had a rough game, with two interceptions returned for scores the other way (the first time the 49ers had multiple interception returns for touchdowns in a game since 1995). Brees finished the day 2-of-9 for 76 yards and an interception on throws deeper than 10 yards downfield, his worst completion percentage on those throws in the last five seasons. Sunday was the first time this season Brees had more overthrown passes (three) than completions (two) on those throws. Though Kaepernick had an interception of his own, he was 4-for-8 for 98 yards on throws of that length. That included a pair of third down completions to Delanie Walker, extending drives that resulted in a touchdown and a field goal.